Welcome to our Lübeck Haus Bookstore catalogue page for books and pictures on and about the Dresden Frauenkirche. Frauenkirche Dresden can look back on a 1000 year history. Its predecessor churches were dedicated to the Mother of God and called Frauenkirche. In the 18th century, the famous dome structure designed by George Bähr, was built and has dominated Dresden's cityscape for 200 years. The church was destroyed shortly before before the end of World War II, on Valentine's Day. It's ruin remained as a war memotial in the heart of Dresden. The conviction that the Frauenkirche that had been totally destroyed simply had to be rebuilt was shared by many people within both Dresden and elsewhere. But it took 45 years for the realisation of this dream to become a feasible possibility. Initial endeavours to start rebuilding were already undertaken in the last months of the Second World War. As the reconstruction of a church was not, however, a priority issue in the GDR (former East Germany), conditions favourable to this didn't exist until after the political changes that led to the reunification of most of prewar Germany. Thanks to the impressive efforts made by the citizen's action group, the reconstruction concept was spread throughout the entire world. Over a period of more than 11 years, the church was rebuilt piece by piece. Frauenkirche was rebuilt, keeping within the design specifications set out by George Bähr for the old church and using original construction materials to the largest extent possible. In total, 60 years went by before the Frauenkirche in all its baroque beauty could reopen its doors to the world. On October 30th 2005, the celebratory consecration took place to mark the conclusion of the church's reconstruction. The books and photographs on this page are offered for sale in association with Amazon.com. ORDERING BOOKS: To order any book listed on our bookstore's catalogue pages, click on the book title. Read the book details, book descriptions, content, prices, and availability. Then to purchase, place your book in the shopping cart at the Amazon.com page and complete your purchase by following their shopping cart instructions. If you are not ready to complete your purchase at that time, your book can remain in the shopping cart until you are ready to purchase the book. Your book choice can be "stored" for up to eighty nine days. Then when you are ready to complete your purchase, return to the shopping cart at Amazon.com and complete your purchase by following their instructions at the shopping cart. These browser boxes to search the entire Amazon.com web site database for any book title from many subjects and categories. Browser Boxes . To locate more Dresden Frauenkirche books, remove Search Amazon. Then add Dresden Frauenkirche books. Then click on GO. To locate more Dresden Frauenkirche Pictures, remove Search Amazon. Then add Dresden Frauenkirche Pictures. Then click on GO. Return to the top of the book list by Clicking Here. View 3.27 minute youtube movie. Dresden, The most beautiful city in Germany. A short history of the Dresdner Frauenkirche. Dresden: Blick auf den Neumarkt und die Frauenkirche. Visit the Frauenkirche website in Germany for more information on our Frauenkirche in Dresden. 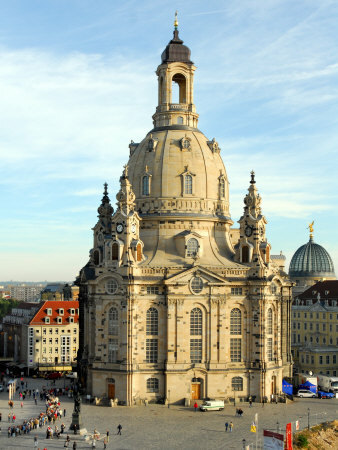 Click on and browse through a selection of Dresden Frauenkirche MP3 downloads. Use these Browser Boxes to find more books on Dresden Frauenkirche, Dresden Frauenkirche pictuures, Lübeck, to browse any book category, or to find any product. Return to German Ways Website Website Directory. Browse our bookstores catalogue for all of our book categories. Offers an extensive selection of books, kindle books, kindle readers, audiobooks, DVD and VHS movies, music CDs, home & office electronics, office supplies, digital computers, computer and game software, power tools, hardware, clothing, apparel, watches, jewelry, magazines, games and toys. This page last updated October 12, 2018.